Spring is just around the corner which means our little beach babes have started dreaming of summer holidays and planning out our coastal adventures. Last weekend they took over our playroom with their teepee, all their favourite beach books plus a little Allen’s ocean themed treat to plot and plan out about our summer adventures. 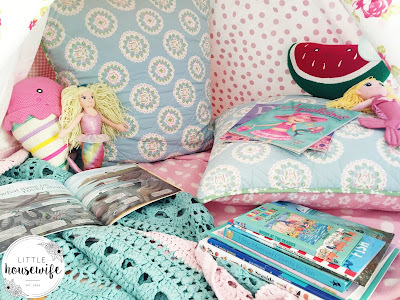 Check out the cozy nook they created! 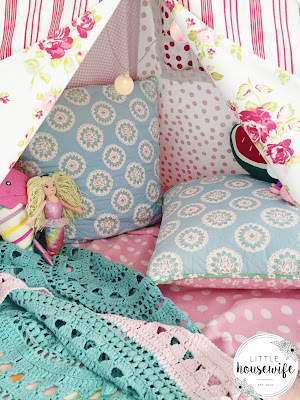 They filled the teepee with cushions, cozy blankets and their mermaid dolls. They even strung fairy lights up inside! My girls know how to decorate! While they busied themselves with that, I was sent to find all the beach books they have between them. 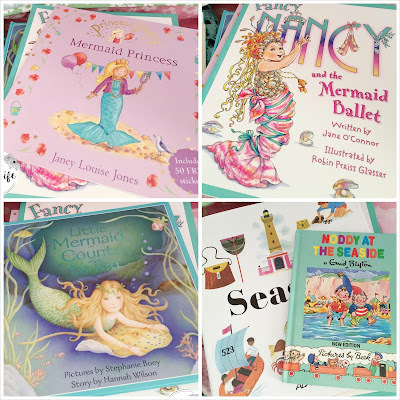 I didn't realise they had quite so many books about mermaids! 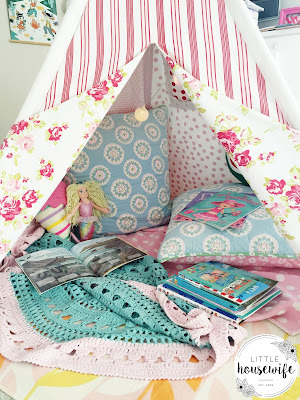 They spent over an hour snuggled in there chattering away and reading their favourite stories. 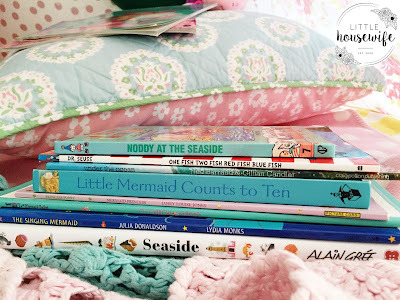 Some of their favourites include Princess Poppy Mermaid Princess, Fancy Nancy and the Mermaid Ballet, Little Mermaid Counts to Ten, The Singing Mermaid, Daisy the Doughnut Fairy, Aqualicious and One Fish Two Fish Red Fish Blue Fish. Plus I threw in a couple of vintage titles too - Seaside and Noddy at the Seaside. 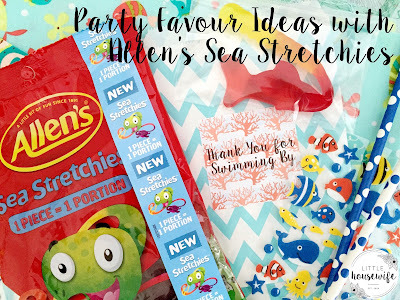 After about an hour I could hear them bickering over which book to read next, so I stepped in suggesting a break, giving each of them an Allen's Sea Stretchie that I had left over from the ocean party favours I had made a few weeks ago. 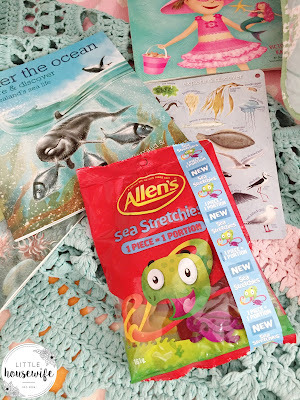 Instead of squabbling, they set about trying to find their Sea Stretchie in the amazing New Zealand Under the Ocean and At the Beach books by Ned Barraud and Gillian Candler. They are so beautiful and the kids love them. I highly recommend them! 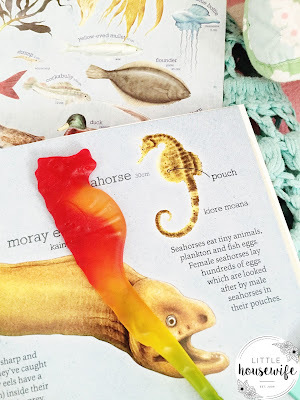 Maddie was quick to find her seahorse (thanks to her being able to read and use an index and all!). Maisie eventually found the sharks and thankfully there don't appear to be any Saw Sharks in New Zealand waters! But enough reading! 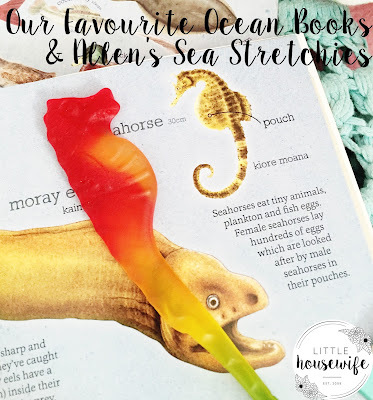 It was time to streeeeeetch their Sea Stretchies to make them last longer (these things stretch about twice their length) and then gobble them down! 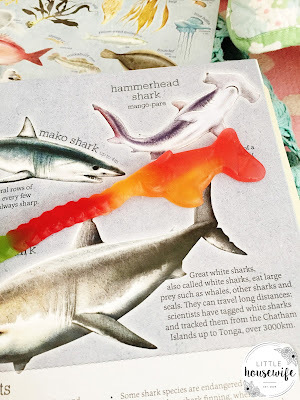 The awesome thing about Allen's Sea Stretchies is that 1 piece = 1 portion and I think they are pretty generous in size too (about 16cm long or as long as an adult hand) so the girls think this is an awesome treat which lasts for ages and I know that it's a treat wise serving! 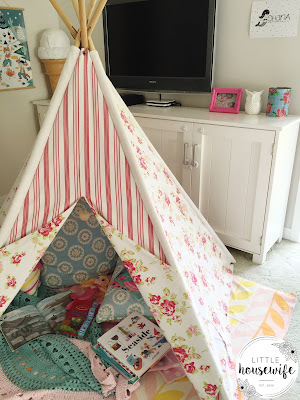 The teepee is still set up in our playroom and the girls come and go from it when they need a quiet place to spend some time. I can't wait to set it up outside so they can continue their reading over summer!